Frank Lloyd Wright’s office for Edgar J Kaufmann is one of the most important twentieth-century objects in the V&A’s collections. Designed by the most significant American architect of the century, it is unusual both in that it retains all of its original woodwork, furniture, carpets and textiles. The room was designed for Wright’s most distinguished patron, department store owner Kaufmann, who installed it in his store in downtown Pittsburgh. Around 1929 Kaufmann had begun modernisation of the store’s interiors by commissioning the architect of his medieval-style Pittsburgh home, Benno Janssen, to introduce an American version of French Art Deco to the store’s ground floor. By 1934 Kaufmann was discussing with Wright the design of weekend house that was to become the architect’s best-known structure, Fallingwater. In the following year the design of Kaufmann’s office had at least notionally begun. Although a small project compared to Fallingwater, the office was one of a group of designs for Kaufmann which included a planetarium and office building. Perhaps more importantly, the office was part of an unusually productive period for the architect – often referred to as his ‘second career’ or ‘second golden age’ – one which, in addition to Fallingwater, saw the design of the Johnson Wax Building, the series of Usonian houses and numerous exhibitions and publications of his work. 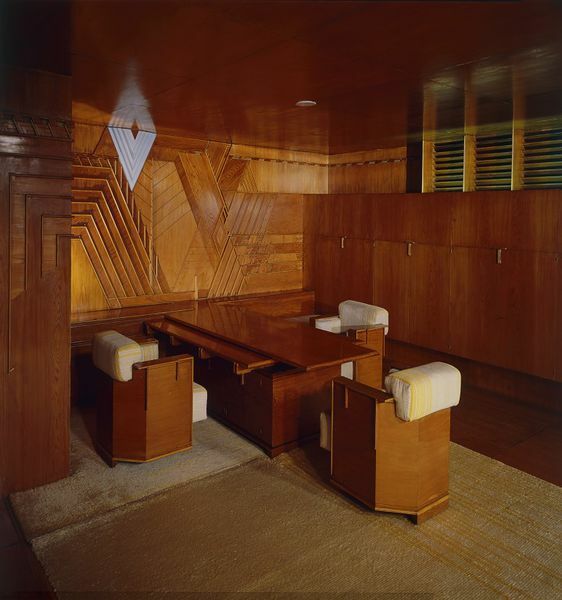 Although designed for a wealthy client, the office was constructed largely of modest materials which became typical of Wright’s better-known Usonian houses: cypress plywood and cypress-veneered blockboard. Built-in and freestanding furniture of advanced design played an important part in the interior, defining the essentially rectangular space of the room. The monumental and sculpted presence of the furniture was overshadowed by the highly unusual mural above Kaufmann’s desk. Described by Wright as a “marquetry plywood wall”, it is a fine example of Wright’s decorative tendencies as well as his interest in triangular and diagonal forms and, ultimately, of the relationship in his work between nature and geometry. The room’s carpet and textiles were designed by Loja Saarinen who headed the textile workshop at the prestigious Cranbrook Academy of Art in Michigan, USA. This room occupied a corner of the building it was designed for. It's two perimeter glass screens measure 670.6cm and 312cm. The room is basically rectangular with a notched out corner, making it slightly L-shaped. All six walls, the ceiling and the floor are constructed of swamp cypress plywood. Standard plywood sheets in America were produced to 8' x 4'. These dimensions have been utilised by Wright by constructing a three-dimensional module 4x4x4. The length of the entire sheet becomes the room's height (8') while the ceiling and floor are clad with 4' x 4' squares. Light from the exterior glass screen of the two adjoining walls penetrates through the louvres set in a 2' module, also made of cypress wood. On one wall the louvres extend fro the ceiling down to the top of built-in cupboards, while on the other, the louvres run all the way to the floor. The main feature of the room is the mural taking up an entire wall surface, and extends its ornament onto four other walls. The mural is composed of pieces of the same swamp cypress plywood and strips sawn to size on site. The pattern is geometrical, consisting of 30-60-90 degree angles, thus forming triangles, rhomboids or hexagonal shapes. A relief effect is achieved through layering the plywood and highlighted by the insertion of strips even further forward. Depth is also given by saw cuts into the plywood. A further intensification of pattern is achieved by having the boards cut either perpendicularly lengthwise or at an angle with the grain. A focal point is created by a light fixture incorporated in the design as a triangle of translucent glass, flush with the plywood. At the base of the mural is a shelf which at one point extends into the roomand forms the top of the desk. This desk consists of two surfaces that overlap each other and cantilever over the box-like space. Underneath the desk is a pencil note reading 'Manuel J. Sandoval & Ray Porraz. march 18/37, from Nicaragua and Guatemala C. America'. This office was commissioned in 1937 by Edgar J. Kaufmann (1885-1955) to occupy a corner of the 10th floor of his department store, Kaufmann's, located at 400 Fifth Avenue, Pittsburgh, Pennsylvania. It was removed from this building in 1957 by Edgar J. Kaufmann, Jr (1910-1989), to the 15th floor of the National Bank Building, Pittsburgh. In 1963, Kaufmann Jr moved premises, placing the office in store until it was given to the V&A in 1974 [RP 72/1000]. It was displayed in the Museum's main entrance for several months during 1974, before being placed in store. The office was not shown again until 1990/91 when it was loaned to four venues in Japan (Kyoto, Tokyo, Yokohama, Kitskyushu), it was seen by over 150,000 people during its Japanese tour. Once it returned to London, plans were made to install it in the V&A's Henry Cole Wing, where it remained on view from January 1993 until 2005. Parts of the office were lent to Tate Britain for the 2013 exhibition, Schwitters in Britain. The office and furniture were designed for the Kaufmann Department Store, Pittsburgh.